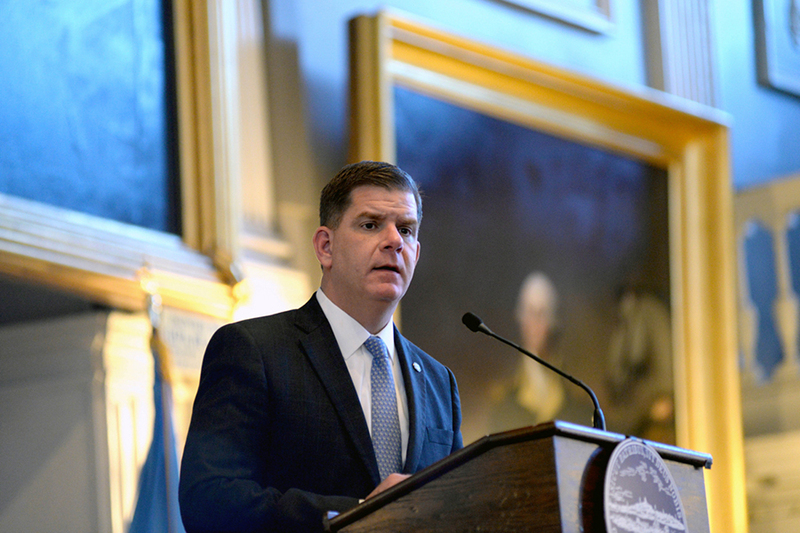 Mayor Marty Walsh announced a snow emergency will go into effect at 7 a.m.
By Hayley Glatter·	 1/3/2018, 3:48 p.m.
Boston Public Schools will remain closed for the second-straight day on Friday due to the winter storm pummeling the city with high winds rapidly falling snow, Mayor Marty Walsh has announced. A snow emergency went into effect at 7 a.m. on Thursday, at which time cars still parked on the street began to be ticketed and towed. The city has not issuing a driving ban, but officials have strongly recommend that residents remain indoors during potential white out conditions. On Wednesday, Walsh emphasized the need to get cars off the roads ahead of time so plows can clear main thoroughfares efficiently, but many vehicles remained in the way on Thursday. Discounted parking garages have been made available, and the 48-hour space-saver rule will go into effect on Thursday everywhere but the South End, where space savers are banned. The MBTA is up and running on Thursday, with some delays, particularly on the commuter rail. On Wednesday, Walsh said he was “confident” the T will remain operational, but said with so much snow, “you’re going to have a hard time with a brand new car,” much less a sprawling public transit system. Boston Police, Fire, and Emergency Medical Services will have an increased presence around the city during the storm, and can help doctors and nurses get to work if there are significant backups on the T.
There are also beds available in the city’s homeless shelters, which are open 24 hours a day. People are not being asked to leave the shelters, and EMTs are on high alert around the city to help anyone disoriented by the weather, Walsh said. The temperature is expected to plummet following the storm, with sub-zero weather predicted for the weekend. As a result, Walsh said that clearing away as much snow as possible from streets, sidewalks, and handicap ramps is especially important ahead of the freeze. Walsh said the city has been working closely with the state to keep people safe during the storm. The city continues to release weather updates on its Twitter account and via the AlertBoston system. Somerville and Cambridge have also declared snow emergencies, and neither district held classes on Thursday. School has been canceled in Somerville for Friday. As of 3:30 p.m., Cambridge Public Schools had not issued a Friday update. This story was updated at 3:34 p.m. on January 4 with information about Friday’s school closures.